Based on our years of experience in carrying out temperature & humidity mapping study, we have developed our own software. 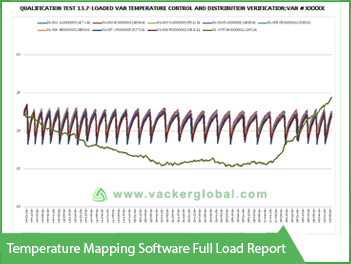 The VacMap software is for the Cold Chain Industry. This software for Temperature Mapping Study can be used by the clients for carrying out their own study. 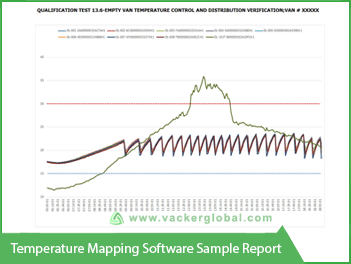 The temperature mapping software produces entire set of reports based on the input values. We have been carrying out Temperature Mapping Study, Qualification & validation around the world. Hence, we are familiar with onsite requirements. Also, we incorporate all requirements of GDP, GMP etc. in the software. We provide in-depth training on installing Data Loggers and deciding the location of data loggers. The location of data loggers are different for reefers, vans, cold rooms etc. based on size. We provide guidelines for writing protocols, SOPs etc. for your assets. The major features of the software are detailed below. Chart of full loaded or partial loaded test are generated. Hot and cold points will be identified. The same will be automatically shown in the layout drawing. Recommended locations for placing sensors for installing the continuous Monitoring Systems. Chart of door opening tests for reefers, vans, cold rooms etc. 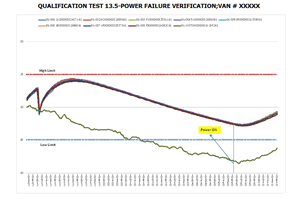 Results and chart of power failure tests. The results will show how long the temperature will remain unaffected after a power failure. Results and chart of start up tests. This will recommend the duration required to achieve desired temperature levels. Mean Kinetic Value (MKT) will be automatically calculated. The MKT, Minimum and Maximum readings of each Data Logger will be given as a report. 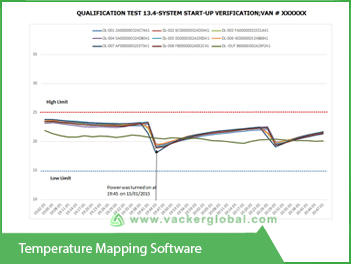 All aspects of Temperature Mapping Validation will be covered. For assets like cold rooms and warehouses, temperature and humidity have to be mapped. In such case, you can use temperature & humidity mapping software. This also depends on the type of material being stored and your quality procedures. For assets like reefers, vans etc. only temperature need to be mapped since humidity cannot be controlled. We will be imparting a complete training on the entire procedure. The training will include the software and execution part. The procedure for each type of asset will be different. Also, there are lot of different criteria to be considered depending on your location. The data collection will be the first part of the procedure. The data thus collected have to be imported into the software. We will be giving training on all these aspects. If you require, we can carry out the entire mapping on one of your assets. During such process, we will be providing training also to you personnel. Depending on the asset, the sampling interval for data collection also will be different. Thermal Mapping Study is exactly same as temperature mapping study. These are different terminologies used instead of temperature mapping and temperature validation. Technically there is no difference whatsoever. We supply the mapping study kit for customers to carry out the study themselves. The temperature mapping study kit will consist of sufficient number of temperature data loggers. The temperature and humidity mapping study kit will be having Temperature and Humidity data loggers. While deciding to purchase, you may specify the asset being studies. Accordingly, we will be supplying suitable Data Loggers. All the data loggers will be supplied with calibration certificates valid for one year from the date of supply. The mapping study kit will also have necessary instructions for carrying out the study, sampling interval etc.